Siberian Huskies were imported into Alaska and America by enthusiasts of sled racing as early as 1900, winning races over gruelling 400 mile courses. In 1925 a diptheria epidemic struck the city of Nome, Alaska, and dog teams were used to urgently transport life-saving serum. The heroic dogs were later to travel to the U.S.A. on a personal appearance tour where the delightful personality of the breed won the hearts of sportsmen who established the breed in the U.S.A. Siberian Huskies were used as sled dogs on the Byrd Antarctic Expeditions, and also in the U.S.A. Army's Search and Rescue Unit during World War II. 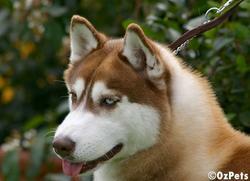 furred body, erect ears and a brush tail, the impression of a Siberian Husky is one of power, speed and endurance. An attractive feature of the Siberian Husky is the eyes which are almond shaped and may be brown, blue, one of each or parti-coloured with a keen and mischievous expression. 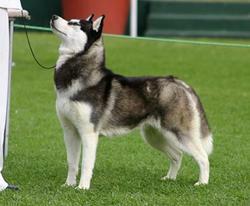 All coat colours and markings are allowable in the Siberian Husky, including many striking patterns not found in other breeds. 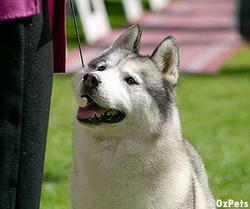 is a popular sport among Siberian Husky owners in Australia who, in the absence of snow in most areas, have adapted the sport to use light weight wheeled `sleds'. No one who watches the dogs' joy on race days can doubt that the breed was bred to run!